Earlier today, I wanted to send a document to my phone from my laptop through Bluetooth, but it kept bouncing back, saying file not sent. I thought perhaps, the phone was too far away from the computer so I kept trying, not bothering to read the message displayed on the screen every time it bounced back. Then I said to myself, okay let me read what the computer says, turns out, it was saying “file cannot be transferred because it is currently in use” **dooh** I told myself, jeez I should have just read. Have you experienced something similar before? The problem is quite obvious and the solution is right in front of you, just a click away, but you are too busy assuming all sorts. Perhaps if you lifted up your face a little bit, you wouldn’t be so wrapped up in problems. Do we often do this to people as well? Yes we do, we assume we know what they are all about for various reasons we witnessed, perhaps all that was needed, was just to take a chill pill, and look up at them to really see what we should be looking at. 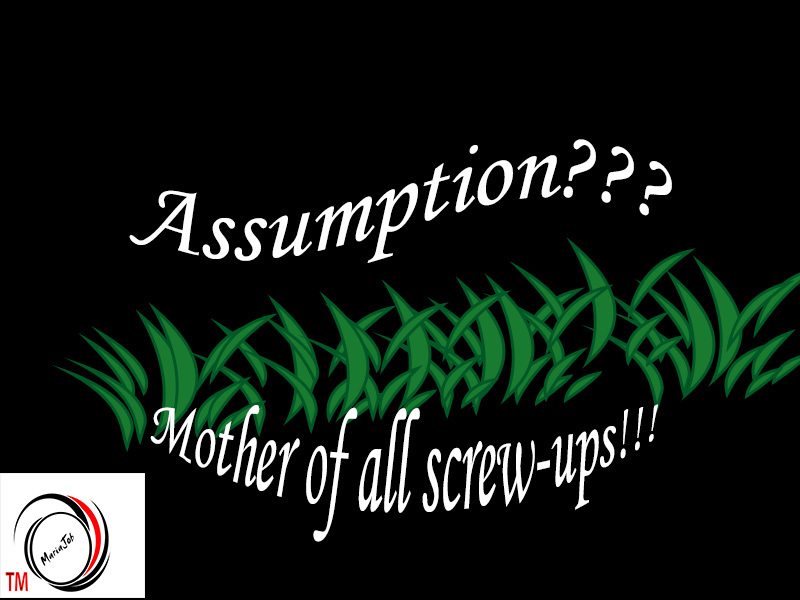 Assumption Kills, if you really want to know, find out, read up or simply ask, as the case may be. Every time you assume, you most likely make a mistake or keep making the mistake. This is not to say that, we should be perfect beings, never guilty of the sin of assumption, this is just a quick reminder for early detection. Don’t keep making the mistake when you detect it, snap out of it and retrace/re-order your step. I wish you all a wonderful week. Cheers. Previous My First Vlog that got uploaded…. Next The Life of my Pens!! Thanks. We all need a reminder. You are so right. It is easy to make a determination of a result without stopping to think first. How much trouble would we save ourselves if we stopped and checked ourselves first.